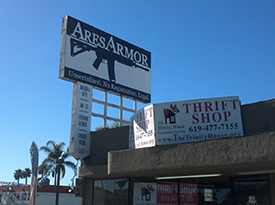 Ares Armor is a veteran owned small business located in California that sells firearms components and other tactical products – and they need your help. Ares Armor is under attack from the anti-gun fascists on the City Council at theirÂ National City, CA location. Ares Armor receives information from local police officer, who will remain un-named at this time, that our sign has angered at least one member of the City Council. This Officer was extremely professional and courteous, he risked his career by giving us this information. He is a true American Patriot who will do the right thing even when the establishment is against him. We will not be releasing his name to protect him from the apparent Tyrannical Government that rules National City. The city fails to identify any individual or even sign the letter in which they threaten us with fines and jail time. In this letter they attempt to interpret their city code very creatively in order to attack an ideology that they disagree with. Please note that in over 90 years of this billboard being refaced time and time again, no previous tenant has received anything like this. We erect our sign and in less than 45 days this is the welcome we receive. You can view the entireÂ saga on the Ares Armor website, and also check out an interview Ares did with NutnfancyÂ which provides more details/background, but it’s pretty clear to me what’s going on – the ultra liberal, anti-gun City Council is abusing their power to push their political agenda. The Local Government of National City thinks it is acceptable to re-interpret their own city code to suite their political agenda if a message appears that does not suite their liking. They have chosen to attack us based on opposing political views. They have abused their elected positions in order to silence those who do not agree with them. WE WILL NOT BE REMOVING OUR SIGN. I WILL GO TO JAIL FIRST! If it is a fight they want, it is a fight they shall have. If you would like to join me in contacting the National City councilmembers toÂ respectfully intercede on behalf of Ares Armor, the relevant contact information is below. I like the guys at Ares, I bought an 80% from them, I think it was well worth the wait. They have had problems with inventory in the past, however, I’ll buy from them again. I think it’s important to note the owner says he would go to jail first, I know a few people who would shoot rather than be taken to jail. Something all tyrants might want to keep in mind…. Thanks for bringing this to my attention. I’ll be sharing a few thoughts with shot scumbags. When I was stationed at the San Diego Naval Station, which is arguably in National City, the base commander issued an instruction to all other commands at the base that sailors were not to leave the base on foot in uniform, and should make every effort not to leave the base in uniform at all. I am very glad that the City Council of National City was able to solve the rampant crime problem that caused the CO to issue that instruction, and now have the time to address things like… billboards. Letter sent to the City Council. Keep up the fight! We’ll take Commiefornia, (we’re already fucked here in England) you keep Pierce Morgan. Just help me to escape – PLEASE! You can come sleep on my couch.